CSOP offers a selection of five-day courses running June 10-14, and June 17-21, 2019. 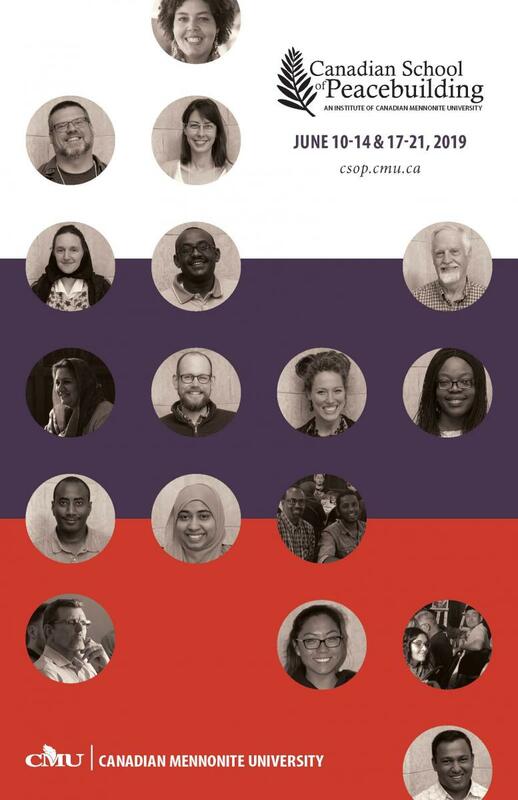 These courses are taught by local, national, and international peacebuilders, to serve practitioners, professionals, activists, students, non-governmental organizations, and faith-based groups. Consider taking a course or two for academic credit with this international network in various approaches to peacebuilding, justice, reconciliation, conflict resolution, and community development. Contact Gina Loewen, MSC Academic Advisor, with questions about courses or process. Learn more about the Waseskun Canadian School of Peacebuilding Bursary offered each year to an Aboriginal or Métis participant. Register for a Conflict Resolution Studies or International Development Studies course through the Student Planning online registration tool in WebAdvisor. Menno Simons College is a college of Canadian Mennonite University (CMU) and affiliated with the University of Winnipeg. View the CMU academic calendar for 2018-19. If you are interested in registering for a course at Menno Simons College, please register through the University of Winnipeg's WebAdvisor.